We are a leading Manufacturer of Trunk Boot Organizer Bag from Mumbai, India. Our exclusive gamut of Trunk Boot Organizer Bag is offered by us at market leading rates in the market. These products are vigilantly designed by our craftsmen, who make use of top quality material for furnishing a well-designed range. The numerous pockets and massive space enables the user to store up plethora of equipment and tool with extreme ease. We are proficient in providing classical looking Trunk Boot Organizer Bag. This offered bag is crafted using waterproof fabric, according to different pockets designed for different items, full use of space, the pocket using a framework design, waterproof, visible and the product to meet the design beautiful and easy maintenance. 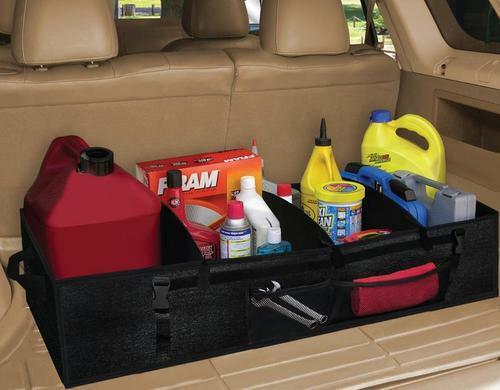 We are one of the leading firms engaged in offering Trunk Boot Organizer Bag. Designed with enduring carry handles and adjustable strap, these organizer bags have several zippered pockets. Besides, these bags also consist of inside separator and open slash pockets. We have designed these organizer bags with quality components which is responsible for its longevity and magnificent quality. The immaculate assortment of Trunk Boot Organizer Bag offered by us is meticulously crafted by our creative designers using quality material. These offered organizer bags are sternly tested for any flaw and fault by our quality analysts. Furthermore, we make sure to offer this product range to the clients in cost effective manner.